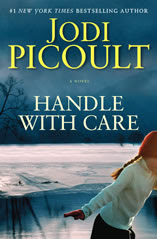 In her latest novel, Handle with Care, Jodi Picoult takes her readers into the heart of another heartrending courtroom battle. It’s like reading one of those People Magazine features about living with an awful disease: pure schadenfreude pleasure. (just in case you think I’m showing off with my fancy vocab – the only reason I know the word is because of a song in Avenue Q) Every time I put the book down, I looked more lovingly at my misbehaving but healthy children. Willow O’Keefe, a precocious trivia-loving 6-year old is the focal point of the novel. She suffers from a rare debilitating disease called osteogenesis imperfecta (OI) which makes her bones extremely brittle and prone to painful breaks. Willow’s mother, Charlotte O’Keefe, sues her obstetrician, who also happens to be her best friend, for wrongful birth. The suit asserts that if the OB had presented Charlotte with the OI diagnosis earlier in the pregnancy, she would have had an abortion. In Charlotte’s eyes, the fact that she is an observant Catholic is irrelevant as she is suing for the financial settlement so that she can afford all the aspects of Willow’s medical care that are not covered by insurance. The case, regardless of Charlotte’s supposed selflessness, tears the O’Keefe family apart and destroys her friendship with Piper, the OB. Charlotte’s husband and both her daughters are all deeply disturbed by the case. None are willing to even speculate about what life would have been like if Willow had not been born. Especially not Willow who is fully aware of the case. Picoult is definitely the master of this family drama genre. I heard her speak last year and she discussed how long she spends doing research to write a book. In this novel, her research was woven throughout, giving not only a thorough understanding of what life for OI patients is like, but also went beyond the disease symptoms to describe the community of OI patients and their families. She described the horrors of affixing garbage bags around the edges of a lower body spica cast to not get it wet with urine as though she had worn one herself. The novel was told in six voices: Willow, Sean O’Keefe (the husband), Charlotte O’Keefe, Piper (the OB), Marin (Charlotte’s lawyer), and Amelia (Willow’s big sister). These characters gave great insight into each person’s particular viewpoint, and provided valuable insight. Picoult transitioned well between male and female voices as well as adult and children points of view. I was particularly fascinated with the Charlotte chapters, amazed by this mother capable of putting forth such a horrible claim in her lawsuit, all because she thought she was helping her child to win a large settlement. It was hard not to condemn her, hard not to loathe her, and I wondered how Picoult could handle being in her head as she wrote all those chapters about her. I enjoyed Handle with Care thoroughly. The characters were well-drawn, the prose a pleasure to read, and the plot was thrilling. However, part of me found it a bit formulaic. The last Picoult novel I read, My Sister’s Keeper, had such a similar format: sick sibling, lawsuit, other sibling viewpoint, mother with questionable morals. I’ve read many of Picoult’s novels (The Pact, Keeping Faith, Plain Truth, Salem Falls, Nineteen Minutes … to name a few), and I hope that she will break this mold and surprise me again with her next novel. She is too talented a writer to be typecast with one plot formula. >I'll read this when it comes out in paperback, as I usually do, but I have to admit the surface similarities to My Sister's Keeper have made me feel like Picoult might be getting into a bit of a rut. It sounds like you might be feeling a little of that too, but I'm glad that overall you liked the book. >I saw Jodi speak last year, too, and I was impressed by her devotion to her research. As a writer, it's hard for me to condemn another writer who has found something that works. As a reader, like you, I want something different.